A lightweight aluminum assembly with a specially designed shape gives the Gull Wing Deflector the ability to redirect the feed broadcast blower’s airflow to change the feed drop spread pattern without pellet damage. Traditional methods of feed pellet disbursement use a deflector plate to physically alter feed pellet trajectories and in the process cause high levels of pellet breakage and the generation of unwanted feed dust. By redirecting the flow of air from the bottom side of the feed broadcast outlet, the resulting cushion of air is used to redirect the flow of feed pellets across the two purpose shaped ‘wings’ for even disbursement over a wide area. The ability to adjust the ‘wing’ angle provides the opportunity to set the shape and size of the pellet drop zone to best suit the tank, raceway, or pond configuration. This also optimises feed pellet spread which helps to minimise feed competition and maximise Feed Conversion Rates. 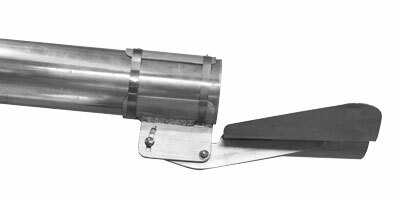 Designed to redirect feed pellets using the blower’s airflow to cushion pellets against impacting the deflector ‘wings’. This guarantees maximum feed broadcast distance and no broken feed pellets or dust creation. Set feed pellet drop and pattern to ensure maximum spread and minimum fish feeding stress as needed for best Feed Conversion Rates. Simply slide over feed hose outlet or Feed Extension Tube outlet and clamp into position. Single wing nut adjustment allows for infinite settings of feed spread pattern.